By ROXY - Serial killer is still a serial killer; Police Chief a murderer. (LOS ANGELES, California) The horrific SL-9 Incident was thought to be resolved two years ago. KoopaTV reported on the details with an exclusive interview with then-Deputy Chief of the Los Angeles Police Department, Damon Gant. The SL-9 Incident was a serial murder where businessman Joe Darke killed several people, was arrested, escaped, and then killed a prosecutor (Neil Marshall) before finally being brought to justice for all of those crimes. thanks to Prosecutor Miles Edgeworth and then-Detective Lana Skye. However, on February 21, 2017, the head detective from the SL-9 case, Bruce Goodman, was murdered in the police department's evidence room. Chief Prosecutor Lana Skye, 29, was arrested for the murder, believed to have murdered Detective Goodman in the parking lot of the Prosecutor's Office. Lana Skye's younger sister, Ema Skye, 16, consulted Phoenix Wright, a defense attorney growing in fame and notoriety across the Los Angeles area, to defend her sister. Prosecutor Miles Edgeworth, who was also the prosecutor of the Joe Darke killings two years ago, was selected to prosecute his boss in court. However, it soon became clear in the three-day court trial, lasting from February 22 to February 25, 2017, that everyone involved in Detective Goodman's death was also involved in the SL-9 Incident two years ago, and the detectives involved in the SL-9 Incident believed it was not truly resolved. Former detectives Angel Starr, 31; and Jake Marshall (Neil Marshall's brother), 33, were in the trial as witnesses. Angel Starr, known as the Cough-Up Queen, testified that she saw the moment Lana Skye murdered Bruce Goodman in the parking lot. However, Chief of Police Damon Gant, 65, interrupted the proceedings to state that Mr. Goodman was actually murdered in the police department's evidence room, guarded by Jake Marshall. Jake Marshall, called to the stand, asked Lana Skye if the prosecution had forged any evidence in Joe Darke's trial two years ago, specifically as it related to Neil Marshall. She answered affirmatively, creating such an uncontrollable atmosphere in the courtroom that it was forced into recess for the day. The next day, the conversation went to the turbulent scene of Joe Darke, Neil Marshall, and Ema Skye two years ago in the office of Damon Gant and Lana Skye. While it was previously believed that Neil Marshall heroically sacrificed himself to rescue Ema from a frantic Joe Darke, Phoenix Wright believed that Ema Skye pushed Neil Marshall to his death against a suit of armor's sword. Mr. Wright then postulated that the real killer of Detective Goodman in this present day was none other than Damon Gant, the Chief of Police, based on ID records in the evidence room. This angered Mr. Gant, who refused to testify. An indignant Damon Gant distressed over the accusation of murder and forging evidence. After proving that Ema Skye killed Neil Marshall, Phoenix Wright then disproved his earlier assertion and proved that it was really Damon Gant who murdered both Neil Marshall two years ago, and Bruce Goodman in the present. Mr. Gant's alleged motive was to secure the position as Chief of Police by ending the terror of Joe Darke while framing him for Neil's murder, while also having Lana Skye be promoted as Chief Prosecutor so he could blackmail her and have full control over the Prosecutor's Office. Mr. Gant murdered Mr. Goodman due to Mr. Goodman wishing to re-open the SL-9 Incident, for he was not satisfied with its resolution, which could have exposed Mr. Gant's evidence forging. And so, Damon Gant silenced Bruce Goodman forever. Defendant Lana Skye was found Not Guilty of murder. Lana Skye was indicted on being an accomplice to Damon Gant, but she was shown to not be a murderer. However, it is still believed that Joe Darke actually did kill Edward Jones, Jason Knight, Edith Kirby, Rachel Moss, and Jeb Bates, so his conviction does not appear to be completely falsified. 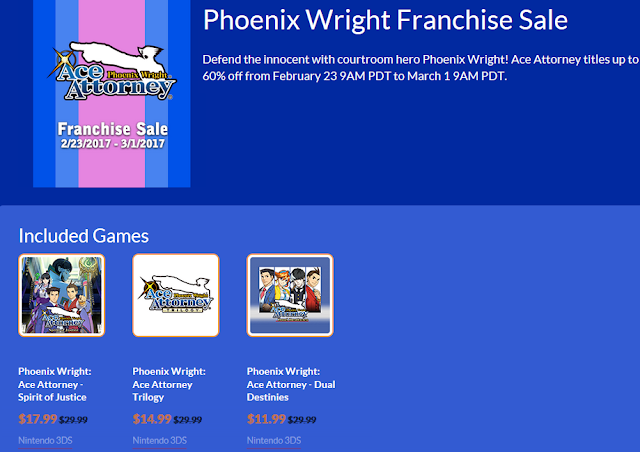 In other news, there is a sale on the Nintendo eShop ending March 1 on games in the Phoenix Wright: Ace Attorney franchise. 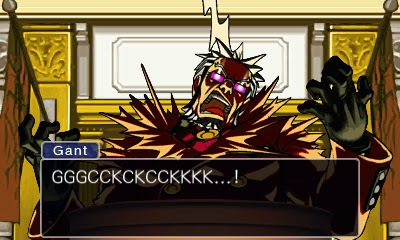 Phoenix Wright: Ace Attorney Trilogy is 50% off at $14.99, Phoenix Wright: Ace Attorney — Dual Destinies is 60% off at $11.99, and Phoenix Wright: Ace Attorney — Spirit of Justice is 40% off at $17.99. These are the same discounts from the 2016 CAPCOM Winter Sale, except Spirit of Justice moves from 33% off to 40%. The sale is less than a week in duration, and is ending fast! CAPCOM has released a statement stating that Phoenix Wright: Ace Attorney — Spirit of Justice is now 60% off, but this is simply incorrect. 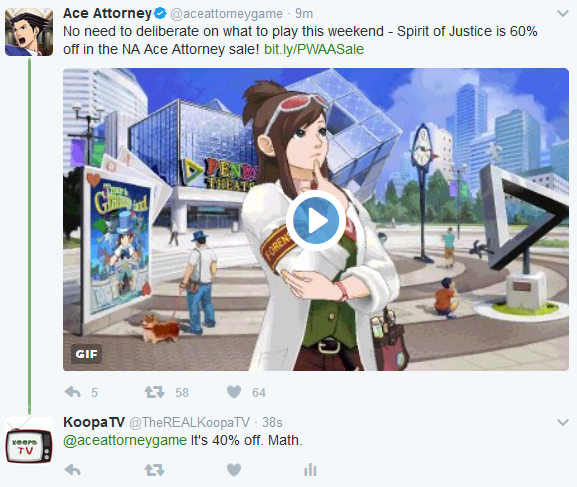 Source: The official Ace Attorney Twitter. KoopaTV has now corrected multiple falsehoods, and hopefully everyone will be happily ever after and at peace. 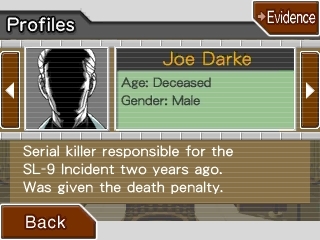 If Joe Darke ends up being exonerated in relation to the deaths of his other victims, KoopaTV will be sure to bring you that information. Here is the next sale from CAPCOM. It's in the summer, and offers interesting percents off. Spirit of Justice hasn't gotten a sale where it's 60% off (yet), but the highest right now is 50% in November 2017. 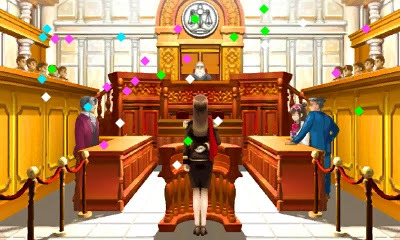 Miles Edgeworth was greatly impacted by this trial, to the point where he didn't want to be around any longer. KoopaTV next reports Phoenix Wright in the courtroom where he does battle (literally) with an impersonator! Look. Ludwig. It's like I tried to tell you before. THAT Los Angeles is in a parallel universe Earth, one other than the one your blog reaches. In the one I'm from all these "incidents" and Phoenix Wright himself...it's all just part of another game, man. Now hold on here. Roxy actually lives on Earth, full-time. I think that makes her some kind of expert on anything actually happening on the planet. ...I refuse to accept that idea. This is very, very serious stuff. People died! I never would have thought that Chief Prosecutor Gant was capable of committing such heinous crimes. Absolute power corrupts absolutely, as they say. Did you also hear that the prosecutor in this case is leaving the country? The rookie attorney not only ruined his impeccable reputation but his ego as well. Who knows if he will ever return? Lana is (was) the Chief Prosecutor. I haven't heard that about Miles Edgeworth, but if he is, that would be a shame. Mr. Wright ruined his reputation right after securing a Not Guilty verdict for him just two months ago!